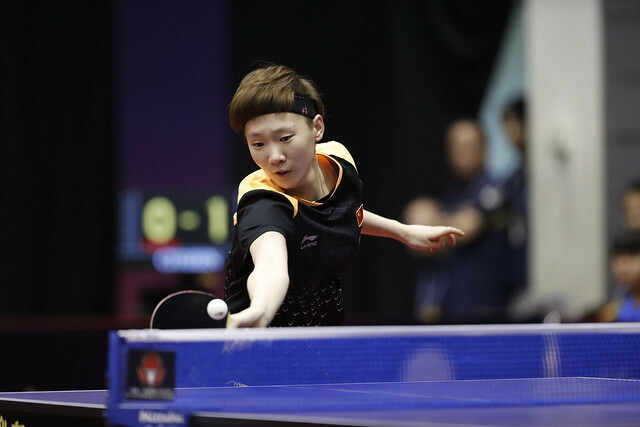 Winners on the ITTF World Tour in 2016 in Melbourne, Minsk and Linz but on home soil at the Seamaster 2018 ITTF World Tour Lion Japan Open in Kitakyushu on Friday 8th June, it was a first round Women’s Doubles defeat for Honoka Hashimoto and Hitomi Sato. The no.2 seeds, the classic defensive partnership, they experienced defeat against a pairing who most certainly are challengers for honours. They were beaten by the Chinese combination of Gu Yuting and Mu Zi (11-8, 11-9, 11-7), a pair with no great record of previous international success but with the former being a left hander, the latter a right hander and both most competent against the backspin place, they present a most formidable team. Defeat for the no.2 seeds, there was also defeat for the no.3 seeds; Hong Kong’s Doo Hoi Kem and Lee Ho Ching lost to Chinese Taipei’s Cheng Hsien-Tu and Liu Hsing-Ying (11-4, 16-14, 9-11, 11-8). 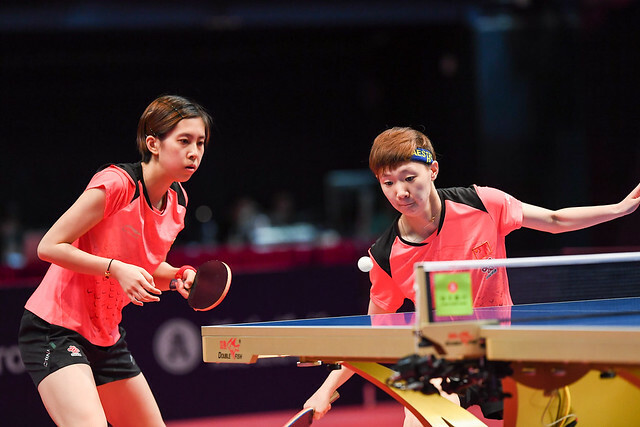 However, that was to be the sum total of success for pairs who had been required to enter the preliminary stage; otherwise it was opening round wins for the seeds and some consolation for Hong Kong. In a hard fought four games duel, Ng Wing Nam and Minnie Soo Wai Yam, the no.5 seeds, accounted for Japanese teenagers Miyuu Kihara and Miyu Nagasaki (9-11, 11-9, 11-8, 11-8). Similarly, the host nation’s Hina Hayata and Mima Ito, the top seeds, beat Korea Republic’s Choi Hyojoo and Yoo Eunchong (11-7, 11-7, 11-7), whilst the latter’s colleagues, Jeon Jihee and Yang Haeun, the no.4 seeds, somewhat made amends for the defeat. They overcame Romania’s Adina Diaconu and Andreea Dragoman (11-8, 11-4, 11-7). Disappointment for Romania but just as with Hong Kong, there was success; Elizabeta Samara and Bernadette Szocs, the no.8 seeds, accounted for Thailand’s Nanapat Kola and Thapanee Phomma (11-4, 11-5, 11-8). Success for Romania and there was success for a further European combination; the partnership formed by Slovakia’s Barbora Balazova and the Czech Republic’s Hana Matelova, the no.7 seeds, overcame the combination of England’s Tin-Tin Ho and Norway’s Ma Wenting (2-11, 11-4, 11-4, 11-7). Meanwhile, in the one remaining contest it was success for China but hard earned success; Liu Shiwen and Wang Manyu, the no.6 seeds, staved off a brave recovery to end the hopes of Singapore’s Lin Ye and Yu Mengyu (11-3, 11-6, 7-11, 9-11, 11-8). At the quarter-final stage Hina Hayata and Mima Ito meet Liu Shiwen and Wang Manyu; Elizabeta Samara and Bernadette Szocs oppose Jeon Jihee and Yang Haeun. In the opposite half of the draw, Chen Hsien-Tu and Li Hsing-Tu confront Ng Wing Nam and Minnie Soo Wai Yam; Barbora Balazova and Hana Matelova play Gu Yuting and Mu Zi. The matches will be played later in the day.